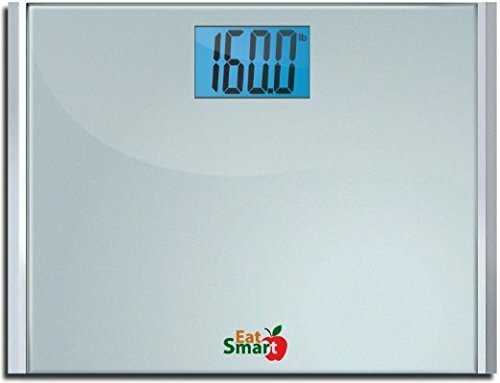 The EatSmart Precision Plus Bathroom Scale is the ideal way to track your weight quickly and easily. EatSmart's proprietary step-on technology allows you to simply step onto the bath scale platform and receive an instant, accurate reading to the nearest 0.2 lb. No more "waking up" your scale by tapping or pressing buttons! The oversized 4.3" LCD display contains a cool-blue backlight, allowing for easy viewing even in the most dimly light areas of the bathroom or home. Engineered to the highest precision standards, the EatSmart Precision Plus features four high-gauge precision G sensors to ensure premium accuracy with each weigh-in. While this bathroom scale's slim, ergonomic design fits perfectly into any surroundings, its 15" wide non-slip platform safely weighs up to 440 pounds (one of the highest capacities on the market). All shapes and sizes can now track their weight both comfortably and efficiently! Along with your EatSmart digital scale, you will also receive our easy-follow instruction guide, 2 AAA batteries, and our 2 year EatSmart guarantee.Consistent and accurate measurement. EatSmart step-on technology provides instant weight readings - no more tapping the scale to turn it on!